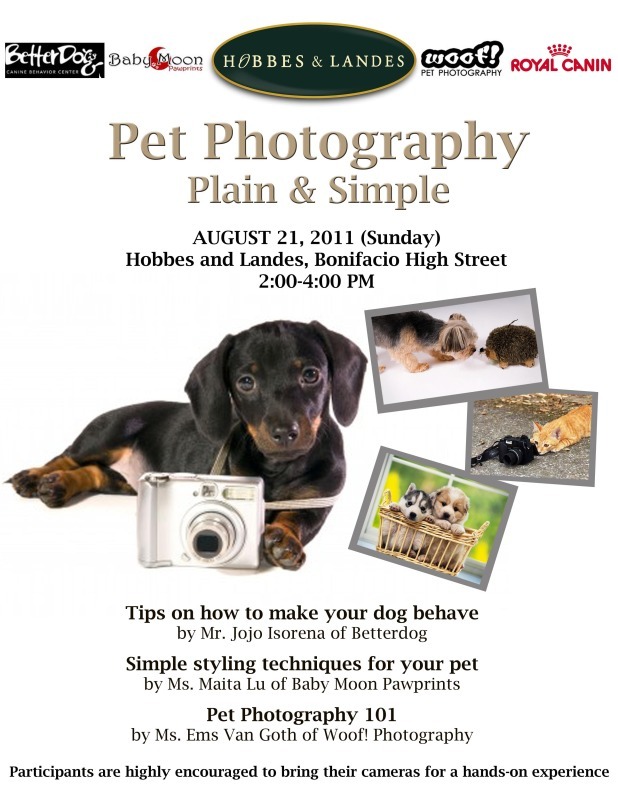 Hobbes and Landes in Bonifacio High Street held a short talk on Pet Photography. I was already about an hour late because of the strong rain. The program didn’t start on time for the same reason and I arrived just on the nick of time. Mr. Isorena talked about dog behavior which is really important, not only for taking pictures, but also for the dogs to behave at all times. Standing still, I think, is one of the hardest to teach your dog. They said that using hats is better than making your dogs wear tees. I think my doggie’s big enough to fit in one of my shirts. LOL A hat would work for Marie, but she would be annoyed. She will remove and destroy it. See how groomed his fur is? He’s really big D: I wanted to pet him, but I was scared. This was the oddest pet among all. It’s a chubby meerkat. I’m familiar with think meerkats that look like Timon from Lion King. Maybe this is a different kind. It looks sad and bored. The program could have been more organized if, first, they gave enough sitting room. Pet owners and their pets could have sat down near the speakers instead of having to stand at the back. But, generally, the program was alright. Mr. Isorena’s topic was the most interesting for me and the dogs gave me the happies. They are so cute! ♥ My Marie’s happy too even though we couldn’t bring her there because they gave away boxes of doggie treats.